BP was pressured to post live video of the seemingly endless gush of oil at the Deepwater Horizon site. Multiple feeds now run online 24 hours a day. ONE IMAGE captures the truth and enormity of the Gulf oil spill, even more than the muck-soaked pelicans. It’s the live video feed of oil spewing into the ocean, which BP was forced to post on the Internet, thanks to US Representative Edward Markey of Massachusetts. Gaining access to the video was a major battle. Now, the relentless scrutiny of that undersea eye — actually 12 undersea eyes attached to a dozen camera-bearing robots — keeps the pressure on the oil company. It also keeps the pressure on President Obama as he tries to buff up a tarnished commander-in-chief image. Whether Obama is meeting with BP executives or walking along Gulf beaches, the camera never blinks on the worst environmental disaster in US history. It’s a damning fountain of truth, brought to the public by Markey, a fellow Democrat. Watching the brown crude gurgling in the corner of the screen as Obama or BP executives address the crisis is akin to watching the Dow drop when Treasury Secretary Tim Geithner first unveiled the administration’s financial bail-out plan. 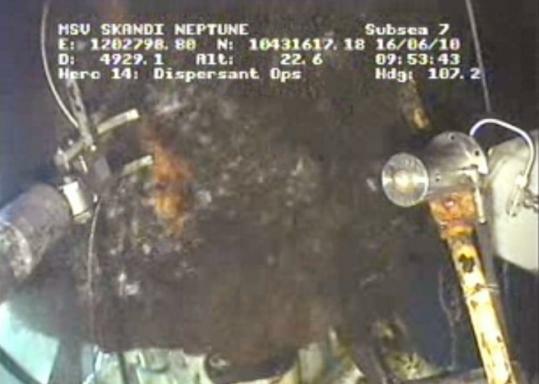 The BP-owned rig exploded on April 20 and sank on April 22. It took several weeks days before BP released any film of the undersea leak, and the company first showed only a few minutes of video. On May 19, Markey, who chairs the House subcommittee on Energy and the Environment, pressed scientists to assess the extent of the disaster. Their spill estimates — up to 70,000 barrels a day — mirrored what one BP official told Markey a week after the explosion, and were much higher than what BP officials were telling the public. Afterwards, Markey demanded that BP post the spill-cam or let Markey’s office do it. Under increasing public pressure, BP gave the video feed to Markey. Markey went to battle once again, when he realized BP was providing only one shot from one camera. Markey also challenged BP’s plan to completely shut down the video when it undertook the “top kill’’ procedure, a strategy that ultimately failed to stop the gusher. When news of the proposed black-out became public, BP backed down. Live feeds from all 12 cameras have been available ever since. The video feed is now available on other websites, including BP’s. But a computer in Markey’s committee office in the basement of the Longworth Building still runs all 12 camera feeds, 24/7, directly into the pool feed for major network and cable programs. Markey said he still doesn’t trust BP. During the next phase of the effort to cap the spill, he wants BP to apply the fluorescent dye that experts say is necessary to accurately measure the speed and quantity of the oil that continues to spew. The amount of oil is important, since BP is liable for every barrel it spills. Markey believes the company deliberately tried to keep the video from the public to limit its liability. The video serves as a constant and powerful reminder of man’s encroachment on environment — “a crime against nature,’’ as Markey puts it. It also measures rhetoric against reality. No one should believe projections like that until the image on the video shifts to a trickle and finally, thankfully stops.